Currently browsing posts filed under "Bicentennial Medals"
UPDATE: President Falk’s speech is available here (text, alas), and a recap of the whole induction is available here. (Hat tip: P’12). Here is a live video feed (starting at 4:30) of today’s induction ceremony and awarding of Bicentennial Medals. Alas, I am coaching soccer, so can’t live blog the event. Perhaps our readers can help out? Add your observations in the comments. Or perhaps we can work out something in which we aggregate and display tweets about the event, as we did with Homecoming last year. Please use #ephblog as the Twitter hash tag. If you are an EphBlog administrator (especially Ronit or Ken), feel free to reorganize this post in whatever way makes sense. The latest EphNotes (a monthly e-mail to all alumni and parents … and students? … and faculty/staff?) 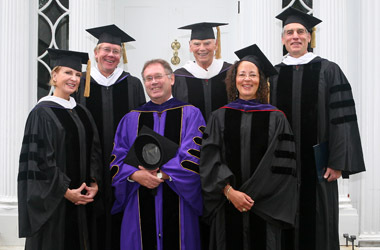 features this photo of the 2009 winners of the Bicentennial Medal standing with interim president Bill Wagner. My first thought on seeing the picture? Wow! 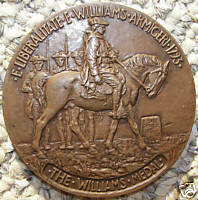 When was the last time that Williams awarded all the Bicentennial Medals in a single year to non-Hispanic Caucasians? 1) Am I a bad person for thinking that? What did you think when you saw the photo? Let’s follow the advice of Attorney General Eric Holder and stop being cowards about discussions involving race! 2) Needless to say, there is nothing particular evil in a lack of diversity in a single year of awardees. But, surely most of the people who run the college would prefer to have a class of awardees that “looks like Williams.” Perhaps this is a signal that Williams is moving beyond crass racial/ethnic nose-counting . . .
3) The list of past winners makes clear that, every year, there is at least one male and one female winner. A little bit of Googling reveals that there has never been a year without at least one non-white winner. Not that there is anything wrong with that! 4) Fun statistical exercise. Assume that the winners truly represent the cream of the Williams crop. What are the odds that the awards would be so nicely distributed in terms of gender/race balance if efforts at balance had not been made? This should only take a few lines of R code . . .
5) I have no problem with attempts at balance. There is nothing wrong with ensuring that the awardees “look like Williams.” And that made the photo all the more surprising to me . . .
John Raynolds was in UDT Class 6 which graduated in November of 1952. He was a part of the officer corps added to the Teams because of the build up of men to serve in the Korean War. The training for this unit included Hell Week, part 2, part 3, part 4, part 5 . They were the predecessors of the US Navy SEAL Teams. The UDT men in Korea began to find themselves more and more operating on land in a series of commando raids. Their assignments included destroying a railway bridge and blowing up railroad tunnels to disrupt North Korean operations and supply lines. It was during the Korean War that UDT men pioneered in sneak inland penetration missions to gather intelligence data and to destroy specific strategic targets such as roads and bridges in the near-coastal area. Night insertion and reconnaissance became important in Korea. 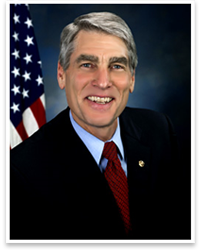 Kudos to John Raynolds and his honorable record of service to our nation! Both these claims are being challenged by members of the UDT/ SEAL Museum and Naval Special Warfare Archives. Clarification, please? UPDATE 9/11/09: The college webpage has been updated to reflect that Mr Raynolds was UDT during Korea, and that that unit, evolved into the SEAL Teams. UDT during Korea is no small matter. It was a highly effective combat unit involved in many high risk operations. John Raynolds was in Class 6 which graduated in November of 1952. He was one of those officers added to the Teams because of the build up of men to serve in the Korean War. There is very little on file for him, but he is in a couple of well known books about the Teams. He didn’t stay in the Teams after the Korean War ended. It is very important that people maintain factual discipline and do not inflate military credentials. Great to find he was a frogman. I wish that I had bid on this Ebay item. SGT Steward Entered service as Pvt. 1st Class in the 63rd Balloon Company U.S. Signal Corps on March 16, 1918; Sgt. 1st Class in the 50th Balloon Company at Ft. Omaha, Nebraska. Discharged January 15, 1919. He was a member of the Enlisted Reserve Corps which was made up of technical experts which likely explains why he was not commissioned during the war. He was living in Ramsey County, MN at the time of his enlistment. 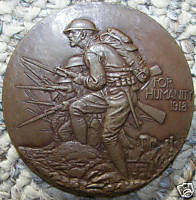 1) Does anyone know more about the history of these medals? 2) What current military mission will seem as out-of-date in 2108 as “Balloon Company” seems in 2008? My guess is manned fighter jets. I have written hundreds of thousands of words on EphBlog over the last five years, none better than these or these. Who will serve so that my daughters might sleep safely in their beds at night? See here for the overview. Who will update our Wikipedia listing? Note that these awards are for “distinguished achievement in any field of endeavor.” Under what definitions of these terms does not a single Eph veteran of the Long War qualify while a renowned slam poet does? Just asking! Another fine article on war, veterans and education from Wick Sloane ’76 writing in Inside Higher Ed. Read the whole thing, but here is the only Williams mention. In helping a Bunker Hill Iraq veteran who will attend Dartmouth College this fall, I had communicated with James Wright, president of Dartmouth. Wright, an ex-Marine, has been visiting wounded veterans in Washington hospitals with James Selbe, another ex-Marine leading veterans’ issues for the American Council on Education. ACE last month had a two-day summit, “Serving Those Who Serve: Higher Education and America’s Veterans (see related essay). Dartmouth has wounded veterans attending. The public institutions are in the lead. I rounded up the usual suspects from the privates, to see if any were following Jim Wright’s lead. I would like to hear a McCain supporter’s version of the reason for McCain’s opposition. It appears anti-intuitive. I am not a McCain supporter, yet I can understand his opposition to this bill. Instead of giving more money to veterans that they can only spend on education, I would rather see us give them the same amount of money that they can spend on anything at all. Not every enlisted soldier wants to go to college; not every office wants a Ph.D. (What I used my GI Bill money for.) Moreover, the extra funding should not go to veterans in general but should be focussed on those serving in the most dangerous, combated positions. 2) Unlike Wick, I am not particularly upset that Williams does not do anything to (specially) recruit veterans. Of course, I would like to see more veterans at Williams and would vote in favor of the College seeking them out. But I recognize this as special pleading on my part. Doing what Jim Wright does for Dartmouth takes time and money, both of which are always limited. It would not be hard for Williams to do more (mainly reach out to the various programs/departments which help veterans transition out of the service), but it is not unreasonable for the admissions office to devote its energies elsewhere. 3) The main change that I would like to see is to have an Eph veteran awarded a Bicentennial Medal each year for the next 5 or 10 years. You can call this quota, if you like, but there is no doubt (in my mind) that Ephs like Bunge Cooke ’98, JR Rahill ’88, Kathy Sharpe Jones ’79 and others have demonstrated “distinguished achievement” in their fields of endeavor. Williams should honor them. Write to Secretary of the Alumni Society Brooks Foehl ’88 if you agree. KERA’s (Dallas) Krys Boyd recently interviewed tropical field biologist Meg Lowman ’76 on Boyd’s always fascinating “Think” program. The interview ranges over a variety of topics, from Lowman’s creation of the first tree canopy walks (she was the force behind the one in Hopkins Memorial Forest), being an international field biologist, teaching (she is a professor at New College of Florida, where she teaches undergraduates), life as the single mother of two boys while working in the field, and women in science. More than anything, I was struck by how much her identity as a parent shapes her worldview and values. She and her sons (who are now in their early twenties, and destined for scientific careers of their own) have collaborated in writing about life growing up in a field scientist’s family. The walkway is a pair of tree platforms set 70 ft. above the ground and originally used for research. Platforms are linked by a cable bridge and accessed via a wooden ladder. Participants are harnessed to safety cables, and aided by guides. Space limited; long waits possible; first come, first served; no children under 12. Lowman has a website, canopymeg.com. Officialy, her title is Margaret D. Lowman, Ph.D., Professor of Biology and Environmental Studies and Director of Environmental Initiatives, New College of Florida, but, if one just adds “Mom,” the subtitle of her website encapsulates it rather nicely: “Author, Adventurer, Tropical Rain Forest Canopy Biologist.” She is very much a proud product of the Williams Center for Environmental Studies, and the College has celebrated her accomplishments by honoring her with a Bicentennial Medal. Are there any others? All of these Ephs have won Bicentennial Medals except for Jaffe, Keating, Schmidt, Larson and Smith. Surely they should be near the top of the list for next year. For those who care about such things, both of the female winners have been awarded Bicentennial Medals. Four of the nine male winners have been so honored. That’s just a coincidence, of course. Nothing to see hear. Please move along. Thomas Payzant ’62, professor of practice at the Harvard Graduate School of Education, will be the featured speaker at Williams College’s Convocation, Saturday, September 8. The event will be held in Chapin Hall, beginning at 11 a.m. Professor Payzant is the former superintendent for the Boston Public Schools. Convocation is the traditional celebration of the new year at Williams, when the Class of 2008 is recognized as they begin their senior year. The public is cordially invited to attend what is considered a highlight of the college’s academic year. The event is also the occasion to award the college’s Bicentennial Medals to alumnae/ni of distinction, as a way for students to see the important ways in which Williams graduates contribute to their world. In addition to Professor Payzant, those receiving medals will be Margaret Kim ’91, award-winning director of historical programming for The History Channel; Reed Zars ’77, environmental lawyer; Steve Lewis ’60, president emeritus of Carleton College; H. Ward Marston IV ’73, Grammy award-winning musician and pioneer in the field of audio restoration; and Alice P. Albright ’83, who pioneered finance mechanisms to deliver vaccines and immunizations to the world’s poorest countries. EphBlog readers know Lewis and Marston. The merit of some of the other awardees is a bit more hidden. Now, in keeping with the new and gentler EphBlog, I ought to tone down my comments a bit. Some might say that my past complaints on the topic have been out of line. But let us start today with looking at both what is seen (the awardees) and what is unseen (the Ephs who could have been so honored but weren’t). For example, my classmates Mark Solan and Rich Gardella have both won Emmys. Pretty impressive! Did the College decide to award them Bicentennial Medals? No. Instead, an award goes to Margaret Kim ’91, whose main claim to fame is that she was nominated for an Emmy. Now, maybe Kim was selected because she is a helpful alum and has a friend on the committee. Maybe the committee wanted to find a woman. Maybe they wanted an Asian-American. Maybe the committee did not know that there were other Eph Emmy winners. But there is simply no way that the main selection criteria was achievement in the media business. And that is OK! There is nothing particularly objectionable about the College selecting Bicentennial Medal winners with an eye toward how much, as a group, they “look like Williams.” But rather than giving awards to Emmy-nominated women instead of to Emmy-winning men, the College ought to think more broadly about what categories it honors. More on that later. This ceremony will be special for me, as one of the major reasons I attended Williams was because Bernard Bailyn had gone there. I was quite a History aficionado in high school, and I figured if Williams could turn out great historians such as Bernard Bailyn and James MacGregor Burns, that was the place for me. it. I’ve attended around six presentations so far, and it’s always fascinating to see what tortuous and interesting paths Williams graduates travel. Morty changed the venue last year — to Chapin during the day so students could attend, rather than at night in Lasell for alumni only — and the students seemed to take a lot of inspiration from what they heard and saw. following is further background on what they’ve done. EphBlog is powered by WordPress and delivered to you in 1.418 seconds using 44 queries..